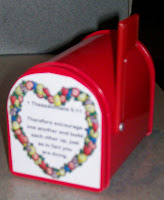 My family has recently purchased a little red mailbox ($1.00 at Target). It sits by our coffee pot in our kitchen to serve as a reminder to leave encouraging notes to each other throughout the day. At the end of the day, we share the notes. This writing activity can be continued throughout the year.